This week I had lunch at The Gladstone, Brighton. Only one vegan option but a tasty one at that! 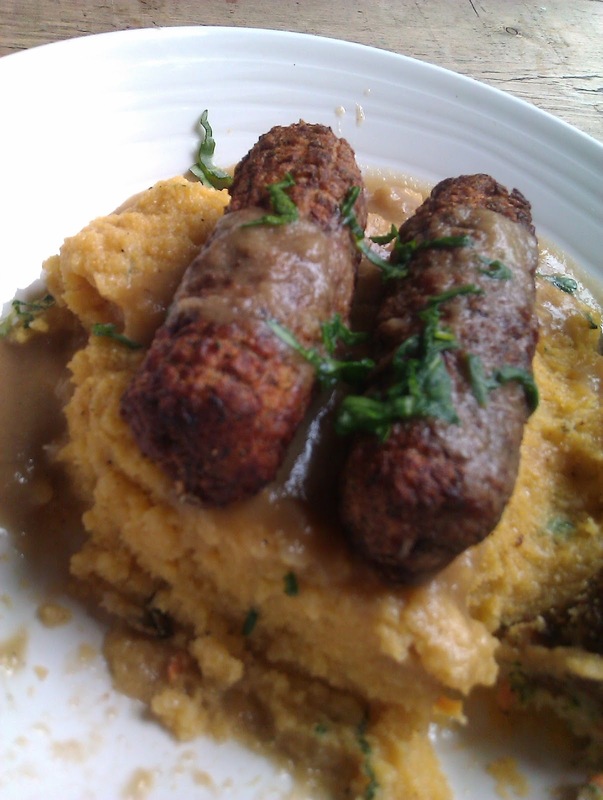 Veggie sausages (the vegetable kind, not the fake meat kind) with polenta mash and an average vegetarian gravy. This was my first taste of polenta and I was impressed, the texture made for a more interesting mash and the seasoning was spot on. I stumbled upon this recipe on - by now you know it's my favourite food blog - Chocolate-Covered Katie (She does savoury food too, who knew?!) and decided I should give polenta a shot in my cooking. I changed the recipe to be one big pie rather than single serve and bought ready made polenta from Sainsbury's - way less aesthetically pleasing! I also used a tin of mixed beans in chilli sauce rather than pinto beans. I cooked up a few matchstick fries which added a nice crunchy texture on the plate. Overall though, I don't think the polenta added anything to the dish, perhaps I did something wrong (sliced and laid on the pie, how wrong can that be?) but the chilli filling was great and would perhaps have worked well with rice or nachos. If anybody has any polenta related stories, success or otherwise, I'd love to hear. Or if you want to tell me how much you love my blog or that it's super boring you can do so now - ANONYMOUSLY! The comment box is working yipee. Warning: Moving to a new kitchen (and house) next weekend so my next post could be early - or, more likely - late. Thank you for another interesting blog. Overall, would you recommend polenta then? Ah garlic butter with anything sounds incredible so i'll have to try it! Sounds like the general consensus is to pick non-instant over the more slimy stuff though so I'll do that in future. Good luck in your polenta experiments! Looks nice, I will try it. I use polenta flour by adding it in my pizza dough along with plain flour, gives the dough some crunchiness.